Today, Oregon became the fourth US state to legalize recreational marijuana. Meanwhile Colorado, Washington and Alaska are all like, “What took you so long?” Then they took a long pull from a vaporizer. Oregon’s new law allows people to possess up to one ounce of pot on thier person or stash up to eight ounces in their homes (which, when you have eight ounces of weed I believe is technically called a “drug den”). But just how much is one ounce of pot? Or eight ounces of pot? Well, the Portland Police have developed a system. 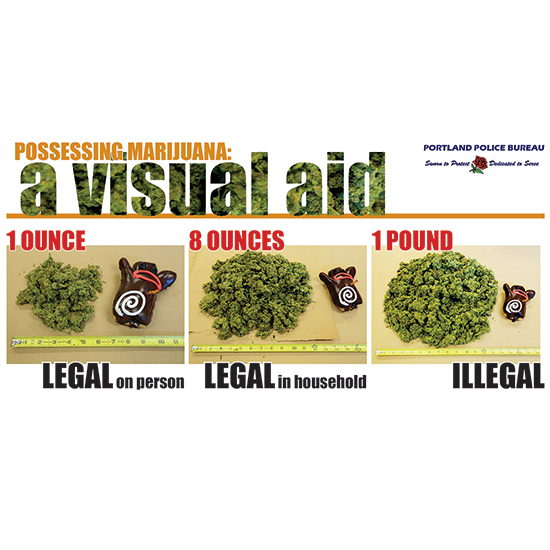 We’ll call it “the doughnut system.” As a part of their marijuana legalization awareness campaign, the police issued a visual aid comparing different amounts of weed to a Voodoo Doughnut – the cult doughnut brand started in Portland. According to the image, the amount of marijuana you can legally carry on your person is only slightly larger in size than one of the doughnut shop’s signature Voodoo Doll doughnuts. Meanwhile, if you like to purchase your pot by the dozen, you are now in illegal territory, my friend. The whole concept is about as perfect as you can get: donuts and cops, donuts and pot, cops and pot, Voodoo and Portland. The number of levels it works on is enough to make a sativa smoker’s head spin.